weeping rain after flashing sunshines, Masheng missing me. this is a serene morning, after a raining night. its lunar Apr 15, so lots of crackers in dawn by villagers memorising their ancestors. i was deeply concerning the portable hard disk God grants me previously. i asked for lean from my youngest elder sister, she promised but so far didn't inform me when i can get it. sinful eldest brother approached me by the excuse of talking his daughter in college in Wuhan, and sat on my stool and profaned quite some moments. i sang for joys after published recent photos. God, dad, Masheng, when is my new marriage that brings me harmony never seen? below is recent tweets&comments by benzrad, 朱子卓. baby's birthday ignored by his mom.^read most day. dozed at noon but woke up by 2 visiting old women in the village. shown them online album for one of them shot by me previously. arranged downloading after dinner then haunted outside. shot some photos in front plaza. chatted with an villager once worked in the county city. baby's mom, emakingir, tentatively ignored baby's birthday today, abiding her mother's freaky picking baby's birthday annually by comparing lunar calendar with Gregorian calendar. shits! sick and sin of mother.^read all day. mother fetched the granddaughter-in-law of my elder brother, a Hu, who is about 2 years old and likely lack of affection, to home to care, for elder brother family busy with field harvest. cared download. at noon got the idea that equipped myself with a portable harddisk. buzzed my youngest elder sister&got her promise of lend me the money. mother complained of sick of too many shits, bought some medicine late afternoon. i haunted outside after dinner, chatted with a worker of state grid but lives in the village. mother again surveillance me&urged me to return home early when i in chat. in night her sick view of personal affection or love shown itself, which quite sinful as God informed me already, to me. God, dad, i never waste a second on the dark in my mother's soul, i linger here for u, for my new life with my girls, esp. girl zhou, my 3rd wife, and my second wife, Masheng, never let me fail in peace on ur lovable land, Zhudajiu village. China mainland nowadays no doubting falling into its last struggle against breaking apart. the dictation elite squad long time preparing for their exit, tried best to grasp more treasures with their corpses in tomb covered by earth. darkness by the evils already scattered by the original potential of Chinese, esp. the heavily handicapped Chinese peasants. China, never belongs to republic nor communist. haircut.^sleepy morning. haircut after breakfast, bu the visiting barber's razor let my upper lid bleeding. it drizzled in the morning. hope i can get my portable hardisk sooner. raining day.^read all time. second time told mother God grants me no anxiousness with living (yesterday told her God grants the new portable harddisk. ), to assure her to rip her usual doubts. she sinfully left dad's house at once in doubts, i also re-download a radio software to reconnect to bible radio. sleepy when i rest on long bench while listening preach in air, however, i managed on notebook, &finished following a talk program from the radio. God, Masheng, let me get my portable harddisk tomorrow in a sunny day, let me talk to baby&his mom, &fix her chrome sooner. Masheng, u asked for assignment, i know, pl bring my girl zhou, as well as my other girls under my Royal of China, join me in new marriage ahead in most blessed time or moment. raining night with remote support for baby's mom.^bathed to clean cut hairs. watched awhile TV till mother retreated from my room. help baby's mom, emakingir, to fix her frequently crashed chrome by equipping it with a new extension to backup/restore sessions, all done online. also tried new way to video chat, now that gtalk heavily lagging&echoes. told my coming new portable hard disk. it rains harder in night. i really love it. The front door of village hall, migrated from village's heritage. a retired worker once lived in county city for a bus company, now lives in the village with his 2 sons&their families. a oleander tree in blossom. enjoying hot summer days: benzrad's tweets before baby son's birthday. baby's birthday today.^dreamed&loathed to get up. its a peaceful bright morning. preparing blog posting since jon my workspace. last night talked to baby&his mom, emakingir, online, about my gift for baby son. i entrust ema to let baby choose his favorite cake, for which i offer a budget of ￥120-￥180, but ema said she is not sure if her timetable allows. 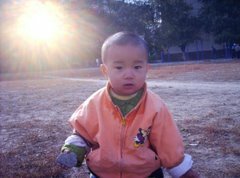 baby, warrenzh, owner of domain warozhu.com, 朱楚甲, happy birthday! sunny morning.^dreamed of fearfully managing to setup a business. dozed awhile after breakfast in the shallow of sunshine aside my workspace. read since then, in my local music. enjoy summer day now.^read most time. neighbors' babble lets me doze, but hostile in the last woke me up. chatted with Taiwanese friend online. its second hot sunny day since rains. life in countryside brings me lots of time in still, when i can see God clearer. talked with folks in dusk, refined profile online in night.^visited village front plaza after dinner, which quite satisfying me, met a villager once worked in the county city&treated me in his company's canteen. talked quite some topics. then haunted the front fish pond. returned&met mother half way, chatted with her friend, an almost blind woman whose husband once worked with my dad for the community in Mao's era. watched TV about snake at home, sensed the evil around. in the night check family knols, refined my plaxo profile. the neighbor, who building their new house, hosted noise villager drank there all time when i done. visiting sister-in-law&her son.^last night attempted to export baby son's mom, emakingir's wordpress blog, but failed many times. then wife&son of my kid brother visited. they now lives in the county city. treated the cousin with pc games. in the night busy with sorting personal settings of chrome while at same time trying exporting blog, went to bed after 10pm. settled family blogs' export&import.^finally got family blogs export, via blogger&convert into wordpress' wxr format, by a online service at http://blogger2wordpress.appspot.com , imported into family clogs, esp. baby's mother, emakingir's at http://emakingir.amplify.com .really a blessing sunny morning. hope my work, cost me more than 8 hours, rewarding. taught lessons for kids in my passed dad, God's shine.^treated visiting village kids with games. missing baby son in God's shine&buzzed him. told his mom my works on blog importing for her. mother cooked a rich lunch for the visiting wife&son of my only kid brother, treated the nephew with animation online, taught folks some lessons in meal. dozed awhile after all left. posted recent tweets. first sunny day after rains.^villager's kids gamed on notebook again, till near 5pm before they left. taught a weak boy always follow his elder sister a lesson, forced the boy cried&sat on ground. claimed family accounts with new etherpad sites, sorted bookmarks. taught mother another lesson when she attempted to show the peeking evils nearby that God's way is like a conspire, let her never stay in dark nor wrong doings. the demon doubting&reckon after dinner,amid the back neighbor celebrating their new house's setting cornerstone, so i haunted outside, walked first time to the road reaching out to main road of the community. chatted with baby&his mom online, via remote desktop updated her local bookmarks as well as her delicious bookmarks. its all time a brilliant sunny day. an old house, likely now ditched. visiting nephew, Zhuyi,朱轶, gamed on my notebook with his niece, 朱露西. scenery Zhudajiu village, Mount Dabei and fish pond.